You can sell your silver scrap to GOLD.co.uk and free up funds for other investments. 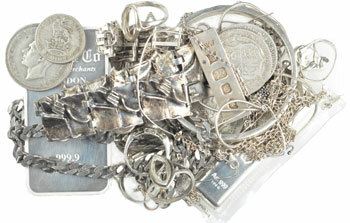 We pay up to 88% of the spot price for your unwanted or broken silver jewellery. Our process is quick, secure, and easy. Simply call us on 0121 369 3000 to fix a price based on silver spot price and the fineness and weight of your scrap jewellery. Once you have your quote, send us your jewellery by Royal Mail Special Delivery. Alternatively, you can come and visit us in our shop in Birmingham city centre if you live locally or just prefer to meet us in person. If you only want to know how much your scrap jewellery is worth right now, you can use our scrap calculator to get a valuation based on the current spot price. Simply enter the purity and weight of your silver into the scrap calculator below and press ‘get quote’ to for the current value of your scrap silver jewellery. Our prices are based on the live spot price and are updated every 2 minutes, meaning you receive an accurate valuation for your silver. We accept 500 silver, sterling silver, and fine silver jewellery, including rings, chains, necklaces, pendants, earrings and more. If you wish to sell your scrap silver, or have any further questions about the process, call us on 0121 369 3000 for more information. GOLD.co.uk will also pay up to 100.1% of the spot price for your silver bars and silver coins. Click here to sell us your silver bars and coins. Please note: The process testing the purity of metals is necessarily thorough and can involve cutting into the jewellery and the removal of stones. If the silver fails to match its description we will either revalue it or return it and the item may have been damaged during testing.